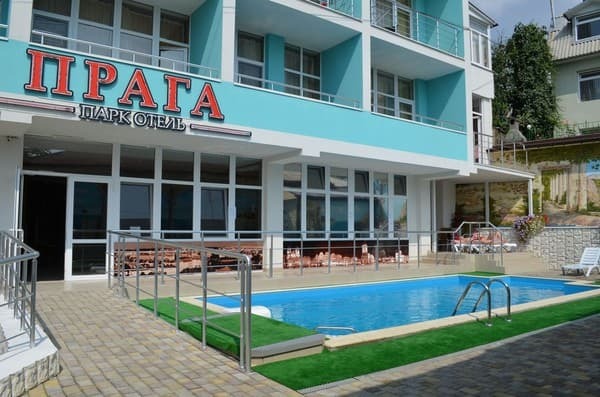 Park Hotel Prague is built in the Czech style, located 100 meters from the sea. The advantage of the location of the hotel is that it is in a park area. Despite the fact that there are a large number of entertainment centers and a convenient transportation interchange, there is peace and quiet around the hotel. 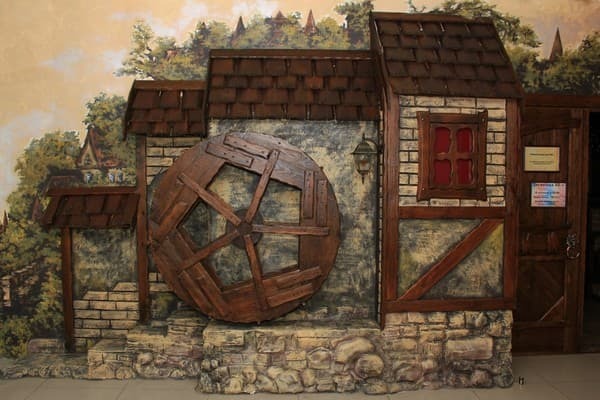 Near the hotel "Prague" is all the famous park-miniatures, Alushta Aquarium and Dolphinarium. For holidaymakers the park-hotel offers 36 rooms. 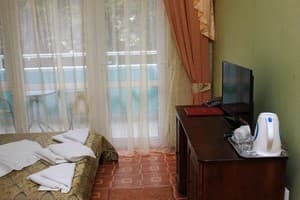 Regardless of the class, each room is furnished with natural wood furniture, modern LCD TV, refrigerator, air conditioning, safe, electric kettle, hairdryer, uninterrupted hot water and free WI-FI. The complex has a heated swimming pool, children's playground and free parking. 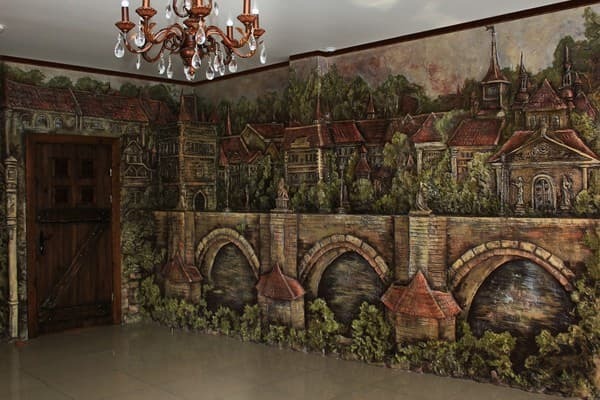 Also on the territory of the hotel "Prague" operates a high-class restaurant with an interior of European classics, which will please its guests with a variety of dishes of Czech and Ukrainian cuisines. The distance from Simferopol is 47 km. 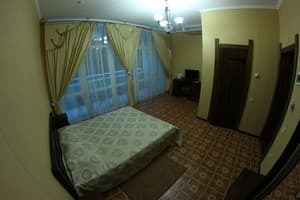 Description of the room: Rooms of the category "Standard" - functional and comfortable, with an area of ​​13 square meters, have everything you need for a comfortable stay. The room has a double bed or two single beds, a wardrobe, safe, table, LCD TV (satellite TV), air conditioning, refrigerator. The bathroom is equipped with a shower cabin with a constant supply of cold and hot water. 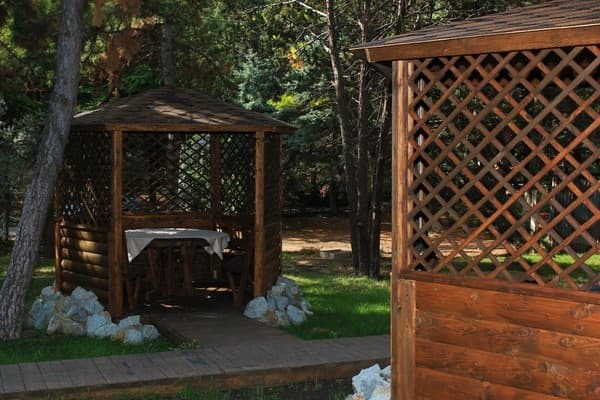 Each room has a balcony, from which a beautiful view of the pine and Crimean mountains. Description of the room: Comfort rooms are spacious, very comfortable, furnished with double beds, bedside tables, closet, table. In the bathroom there is a comfortable bath with round-the-clock cold and hot water. The view from the balcony opens not only to the square and the mountains, but also to the sea. Description of the room: The rooms of the "Superior" category are cozy, comfortable rooms that provide for an extra seat. The room is equipped with air conditioning system class "climate control", as well as a modern LCD TV, refrigerator, closet, which hides a safe. Home comfort creates a kettle, hair dryer and iron. Lovely furnished balcony from which you can admire the sea. Description of the room: Rooms of the category "Junior Suite" - exquisite interior combines comfort and coziness, huge display windows open a panoramic view of the sea and pine needles. The balcony with furniture covers the room on both sides along its perimeter. The room has a double bed, a sofa bed, which provides a comfortable extra space or can serve as a cozy place for relaxation combined with a coffee table. Also in the room there is LCD TV with a diagonal of 108 cm, refrigerator and air conditioning system "climate control". Description of the room: Rooms of the category "Deluxe" - the interior of this room is especially different from others in that there are practically no walls, and huge panoramic windows open a chic panoramic view that will allow you to admire both the sea view and the beauties of the mountainous Crimea. The room is equipped with a double bed, bedside tables, a sofa bed and a coffee table. Air conditioning system class "climate control", a modern LCD TV, refrigerator, hairdryer, iron, electric kettle will make your stay in the room more comfortable and comfortable. Children under 6 years of age without an extra seat are accommodated free of charge. The cost of extra bed and breakfast is 30% of the cost of the main place. 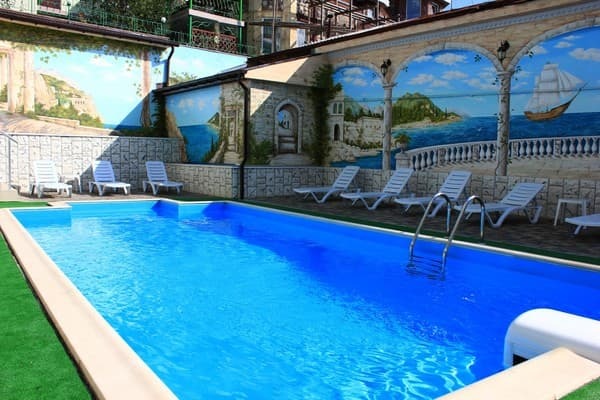 The hotel is located 100 meters from the sea. From Alushta bus station 1 km. The distance to Simferopol is 47 km. From the railway station of Simferopol it is possible to get a trolleybus № 51 (stop "Aquarium"), a fixed-route taxi to the bus station of the city of Alushta.